Vanilla spiced pear butter - is really pear "sauce" that is reduced down to a jam-like texture. 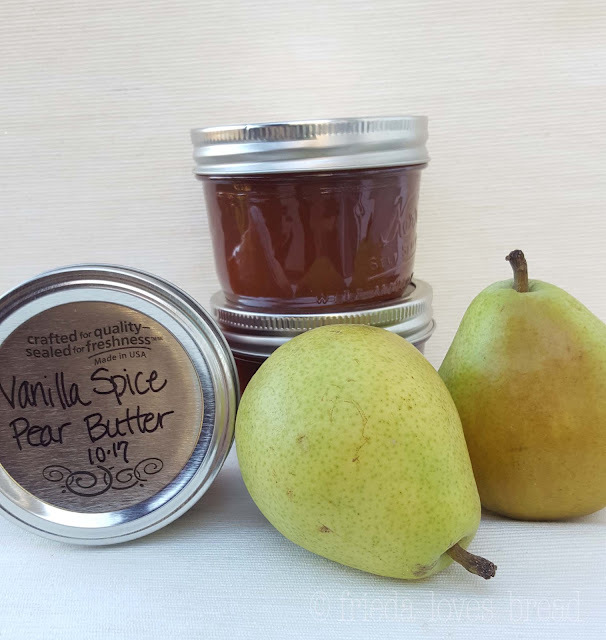 This Pear Butter is sweet, bright and citrus-y, with notes of pure vanilla, cinnamon and nutmeg. 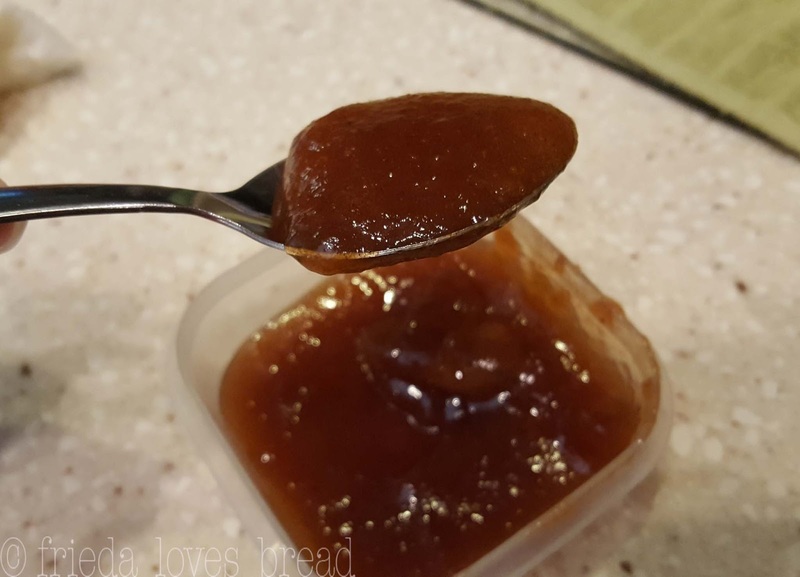 It is a perfect spread for toast, muffins, or stirred into your morning oatmeal, homemade yogurt, or as an ice cream topping, very much like you would use Apple Butter. Using a pressure cooker greatly reduces the cooking time to soften the pears and using the Saute or browning setting helps reduce your pears into a wonderful, thick, jam-like sauce. It is sweet, so feel free to adjust the amount of sugar in this recipe to your desired taste. I am canning this pear butter, and sugar contributes to the color and shelf life of the butter. It also freezes well and makes a nice gift for a family member, neighbor, or friend. I am using Anjou pears that happened to be on sale, but you can also use Bartlett pears. Peel, cut in half, and use a melon ball scoop to core the seeds out. 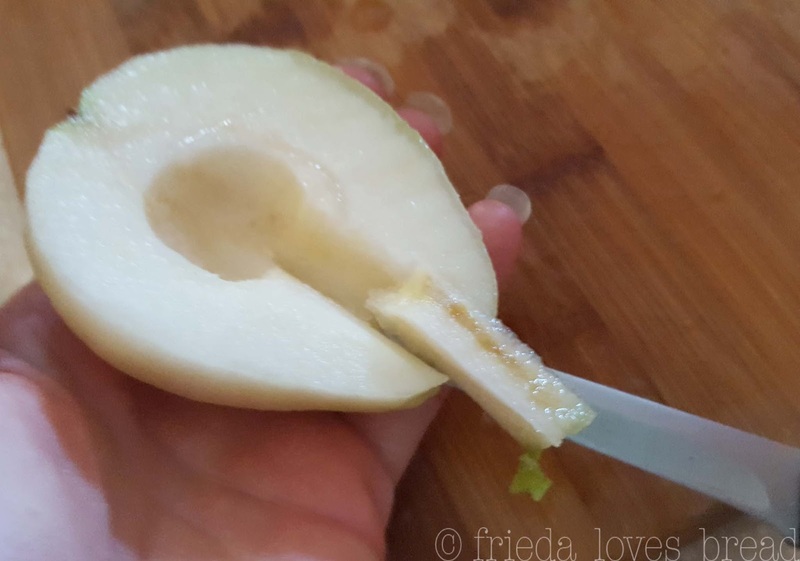 A paring knife works well in removing the stem and the blossom end (bottom) of the pear. 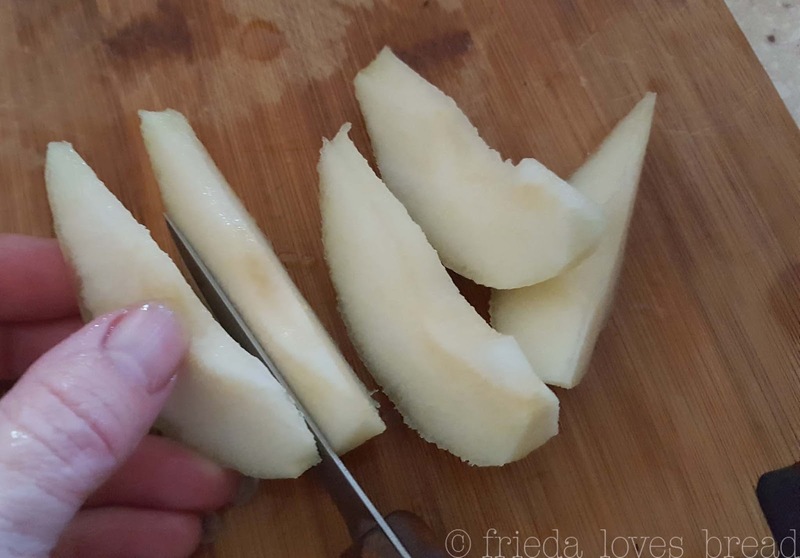 Slice the pear into wedges and put them inside your pressure cooker pot. 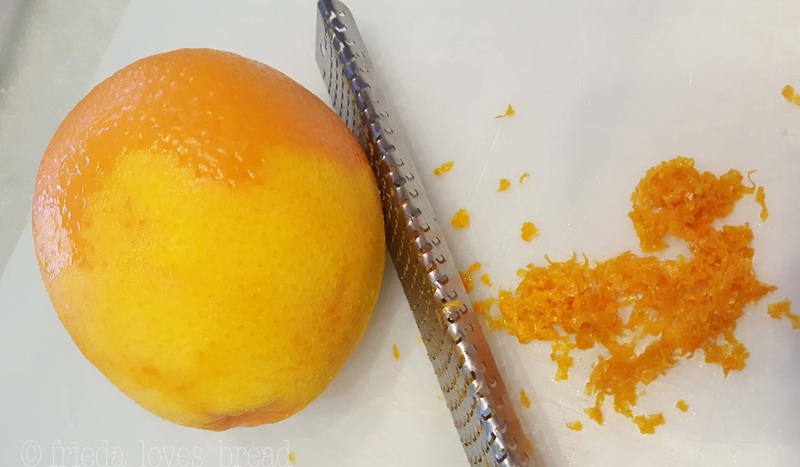 Ad your orange juice, lemon juice, zest, spices and sugar. Using a citrus zester is a great way to add a flavor boost to any dish. A wooden citrus reamer will help you juice the orange or lemon. Cover your pressure cooker and lock it. I LOVE using this ceramic non-stick pot for pressure cooking! It's great for any foods that may stick, apple butter, rice, mac N cheese, etc. Set it for HIGH pressure, and time it for 15 minutes. When the cook time has ended, allow the pressure cooker to release naturally for 15 minutes. Open the pressure valve. An immersion blender is super handy to puree the fruit directly in the pot, without dirtying another dish. You can use a potato masher or a stand blender. Use the Saute or browning setting of your pressure cooker to help reduce the sauce. Stir often to prevent sticking, or use a ceramic non-stick liner to help reduce sticking and burning. If your browning setting is cooking your sauce too hot, choose a slow cooker setting if you have one. You will know it is thick enough when it mounds on a spoon, or when a dollop is put onto a chilled plate, it sets up and is not runny. Put peeled, cored and sliced pears into the pressure cooker. Add water, juices, zest, vanilla extract, spices and sugar. Close the pressure cooker lid and set the valve to Sealing. Use High pressure, time for 15 minutes. Open pressure valve to release any remaining steam. 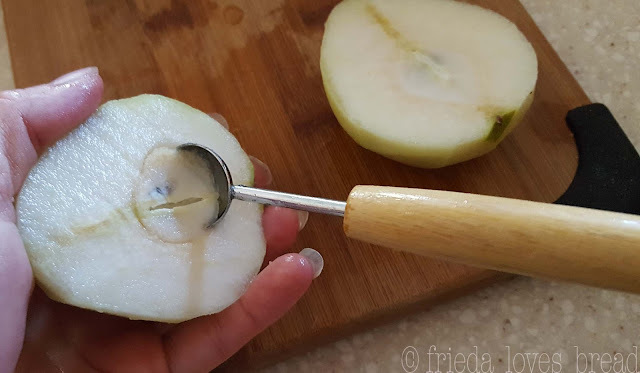 Use an immersion blender, potato masher, or stand blender to puree the pears. Saute Low, or use browning setting to cook and reduce the sauce to desired thickness. Can use keep warm setting (about 145°F) to help thicken. As mixture thickens, stir frequently to prevent sticking and bubbling. Test thickness by putting a small spoonful on a chilled plate. Keep covered in the refrigerator, 1-3 weeks. Freeze in freezer safe containers, up to 3 months. Water bath or Steam can, up to two years shelf life. 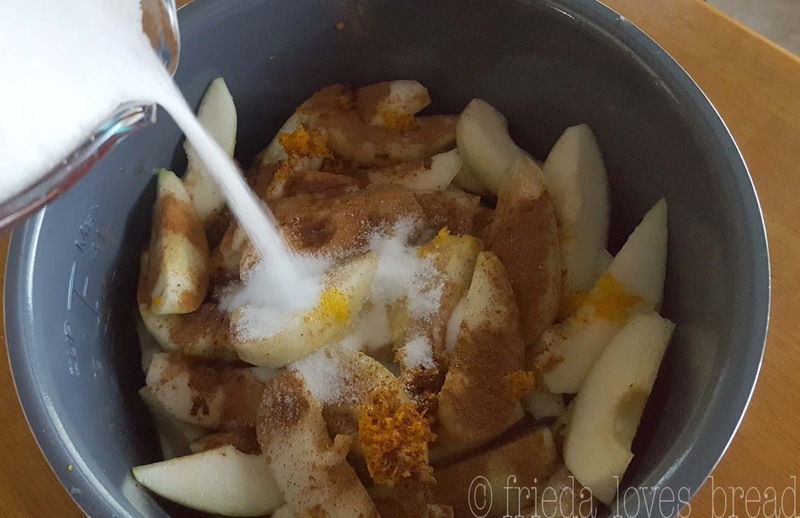 This recipe made 7 half pint jars of Pear Butter. I was able to fit seven, 8 oz wide mouth jars in my 6 quart Instant Pot, when set on a trivet. The tops of the jars must be level with the top of your pressure cooker pot, to make sure the lid closes correctly. IMPORTANT: If you are new to canning or Steam Canning with an Instant Pot (which does NOT use pressure), please check out the following posts first. There are important guidelines to follow and ensure safe canning. 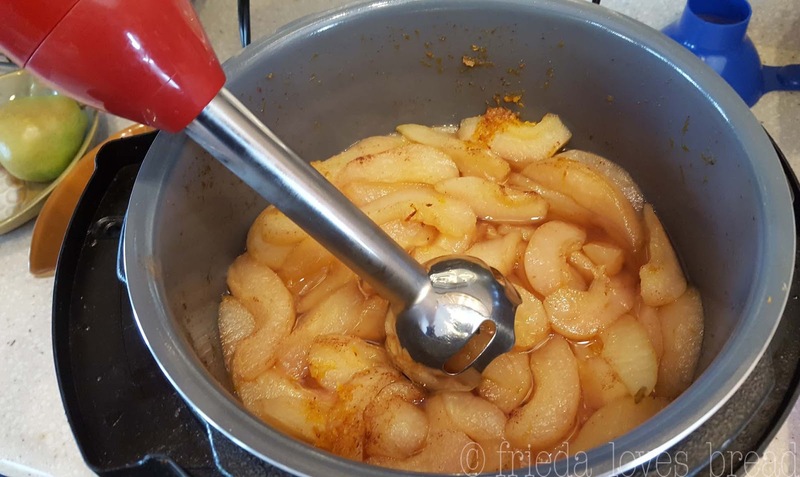 If you do not want to use the steam canning method, you can water bath can your Pear Butter. You can see how water bath canning is used for Jalapeno Jelly, here. Video: Removing jars from the IP. You can hear the seal "pop." 1. Clean jars with hot, soapy water and rinse well. Keep hot until ready to use. 2. Using a canning funnel, ladle hot Pear Butter into each jar, leaving 1/4" head space. 3. Remove any air bubbles with a plastic knife. 4. Remove funnel, and using a clean, damp paper towel, wipe the jar rims clean. 5. 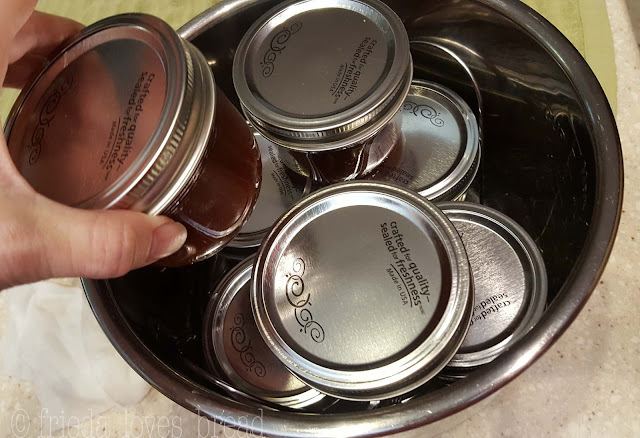 Place new canning lid onto the jar and secure with canning ring, turning it finger tip tight. If stacking a second layer, off-set the jar to sit over two jars - not directly on top of the jar. 7. Cover with the IP lid and lock. 9. Push the STEAM button. After the processing time is up, turn off the IP or unplug it. When the float pin drops, carefully open the lid, keeping steam away from your face. Using tongs or silicone gloves, remove each jar carefully to a wire cooling rack. Do not disturb for at least 12 hours. If any jars do not seal, immediately put into the fridge to enjoy. Label, date and store sealed jars in a cool, dark place for up to one year.